Manuel de Godoy. Goya. R.A. de San Fernando. Madrid. Spanish politician born in Castuera on May 12, 1767 and died in Paris on October 4, 1851. He/She was the son of José de Godoy y Sánchez of the Ríos, regidor perpetuo de Badajoz, and Antonia Justa Álvarez Serrano de Faria and Sánchez-Sarzosa, Lady-in-waiting of the Queen, both born in Badajoz. After entering the Corps guard, he/she won the favour of the Prince of Asturias, which, up to the throne, filled him honors, culminating with his appointment of Minister of Spain in 1792. From then until 1808, Godoy was the referee of the destinations in Spain and absolute owner of the will of the monarchs. Guard Corps in Badajoz since 15 April 1784, requested the transfer to Madrid to his brother Diego. The answer, 25 April 1784, was affirmative (according to Chronicles thanks to the good offices of the Countess of Matallana). In the capital soon earned fame of womanizer; one of her first lovers was to 1788, Pepita Tudo (with the blessing of his Pimp, father Enguídanos). However, despite how much has been said about the love affairs of Godoy, are true, and its rise based on them, Zylberberg interprets his appointment as first Secretary of State, in 1792, as an expression of the need that had Spain, in those moments, find a new man. Its policy was contradictory, since circumstances did not allow you another thing, although always warns in him a desire to streamline his country's economic and social system. 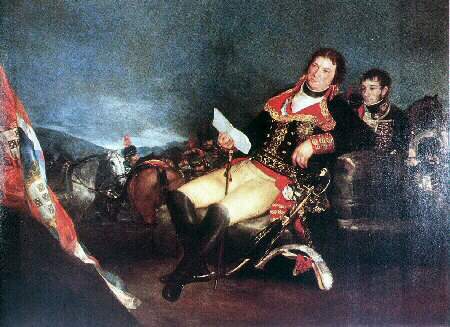 The death of Luis XVI in the guillotine made inevitable war with France, developed with various fortune until the peace of Basilia, in 1795, which earned the title of Prince of peace to Godoy. The changes that have occurred in France with the directory provided a policy of Alliance between Spain and this power, sealed with the Treaty of San Ildefonso in 1796. During this partnership, Godoy led the victorious war against Portugal, known as the war of the oranges, which resulted in the annexation of Olivenza. In 1797 Godoy married María Teresa de Borbón y Villabriga, daughter of the Infante Don Luis. Just then, the 2 October 1797, was appointed in Portugal conde de Évora Monte, preparing you for this a family tree that reached Pedro e Inês de Castro. However, Queen María Luisa tried in September of that same year separated from his lover Josefa Tudó, which had made him marry the aforementioned María Teresa de Borbón, cousin of Carlos IV. Shortly after Godoy came back with the Tudo and Queen irrupted with him. Feeling threatened, he/she received with great cordiality to the Envoy of France, Truguet, and manifested itself very in favour of the Republic, to the point of consent on March 23, 1798 the expulsion from Spain of all migrants. It ardently sought support from the directory, but as it consented not the projected expedition against Portugal, the directory repudiated him, and had to submit the resignation, which was accepted on 28 March 1798. His fall was not accompanied by a total disgrace: he/she continued living in Aranjuez, is allowed to see the shows, the Kings would often dine with him, and only last a few months began to lose influence. However, in the summer of 1799 its star returned to look: the brother of his wife, Luis Borbón, was consecrated Archbishop of Seville, and the Marqués de Branciforte, husband of Antonia Godoy, was promoted to Sergeant major of the Guards Corps and captain general companies. At the end of 1799 he/she already dared to speak out publicly hostile to Urquijo. On 13 December 1800 Urquijo gave Secretary of State Pedro Cevallos. Luciano Bonaparte pushed Godoy to take power, and indeed the two began that same December negotiations on Portugal. These negotiations marked the full return of the Prince of peace to the direction of the business. Foy believes him guilty of the war of 1801; While the French general had an entirely negative concept of Godoy and its methods to get to power, no doubt introduced nuances: it was not evil or cruel, and introduced some useful reforms. Luciano Bonaparte had been the sponsor of the collaboration between Godoy and Bonaparte, although this is made somewhat by the growing power of Godoy along 1801. Godoy was able to negotiate well, making sure their friendship toward France. There was already a secret Treaty, to arrange the Affairs of Parma, and a trade agreement. Godoy rejected it yet on 27 March 1802, although in May of this year the friendship between Bonaparte and Godoy seemed solidly established. Published an instruction given by him for the restoration of the order of Castile the new (Barcelona, 1804). On October 5, 1806, however, Godoy signed a manifesto in which the King demanded the contest of his subjects, in order to defend the homeland of threats present, manifest that it was interpreted as anti-frances, but André Fugier called that's dark. Godoy had believed Supreme ability not to say against what enemy was the manifesto, but the circumstances (Jena Napoleonic victory and the interpretation that the own French gave) located to the valid in a very uncomfortable position. He understood that he/she needed to justify to the Emperor, giving them the necessary guarantees. He/She began to publish an anonymous pamphlet entitled friendly Reprehensión to the Anglomanos on your mode of thinking, by a Spanish affection to their homeland. I needed to also break any bond with the Coalition, Prussia and Russia, and above all convince in Paris of his loyalty. This last left, was not without difficulty. He/She had to start paying religiously all subsidies to France, but Napoleon demanded something more: the accession of Spain to the continental blockade (the invitation you was issued on 29 December 1806). Godoy doubted; accepted for the army ten thousand Prussian prisoners of the twenty-five thousand that Napoleon offered him, but Germans mutinied, and had to resign. Napoleon thought then the sending of Spanish troops to help France, which materialized in the expedition of Denmark, who was going to send the Marquis of la Romana. 13 January 1807 Carlos IV appoints Godoy general Admiral of Spain and the Indies, Protector of maritime trade and Chairman of the Board of the Admiralty, with the title of Serene Highness; all of which gave rise to many jokes, because he/she was a man unable to navigate, although he/she needed it for diplomatic reasons (left advised it is if I wanted to be received by the Emperor). Godoy, who had a growing fear his internal enemies, were their signs of friendship with the French, especially with the new Ambassador, Beauharnais, arrived in December 1806, with whom he/she tried to ensure the control of the army. He/She dreamed of, on the other hand, the French support in its Portuguese project: was Napoleon get a full sovereign territory, which put him under cover of maneuvers fernandine and Neapolitan. This did not prevent other kinds of Adventures: it is believed that in 1807 he/she had a new lover, Margaret, who married with Gabriel González Fernández. Since Poland Napoleon wrote the 21 January 1807, approving the idea of dealing with Portugal, which would be possible through the peace of Tilsit. Etruria was sacrificed, and it was the Treaty of Fontainebleau, October 29, 1807. The process of el Escorial, the 25 of January 1808, either that was the Godoy attitude towards the "culprits", earned him a terrible rise of unpopularity with hatred, at least in Madrid. In January 1808 he/she ordered the closure of the Pestalozziano Institute, which also turned on him. The mutiny of Aranjuez was what would definitely put an end to their power, and the war of independence was the disastrous consequence of his policy. Made prisoner in Aranjuez, was taken to France. Their jewelry, deposited in the Treasury, were confiscated on July 31, and August 1, 1808; the confiscation was taken to effect by Antonio Alcalá Galiano, his uncle. Godoy lived at first with his sovereign, and then settled in Paris. In 1811 is attested the presence in Vitoria of the mother of Godoy, Branciforte, Mortier and others, France road. Godoy was the general anathema during the war. It appeared, however, a part of the correspondence of Godoy with Queen María Luisa, published as a historical document in Madrid, in 1814. The Council of State, in consultation of September 1820, mentioned apropos of his brother, he/she refused to return to Spain on the grounds that, in the case of Manuel, had wanted to be Austrian, in addition to the damning judgment of public opinion. When, in 1828, he/she was widowed, he/she could finally marry the Tudo, her lover always. In 1830 he/she bought the Papal title of Prince of Bassano. His Mémoires du prince de la Paix appeared in Paris between 1836 and 1837, collected in 4 volumes (were translated by J. G. d'Esmenard, who, for some, is the true author of). The Spanish Edition, with the title of the given account of his political life; or memory critical and apologetic for the history of the reign of the Lord D. Carlos IV of Bourbon, six-volume work, appeared in Madrid between 1836 and 1839. In 1844 his goods were returned him legally, but the effective restitution did not take place. Total rehabilitation came with Decree of 31 May 1847, and thereafter returned to collect their salaries. With the first Republic that had been their goods were declared national property (November 10, 1873) and sold at public auction. Dalmiro the Válgoma published his letters of Manuel de Godoy to Ferrer del Río in the Bulletin of the Royal Academy of history (in 1968), cards covering the period between 1845 and 1851. PAEZ RIOS, Elena: Hispanic iconography (Madrid, 1966. 5 v). PALAU and DULCET, Antonio: Manual of Hispanic bookseller. 2nd ed. (Barcelona, 1948-1977). Editor-General of Spain, on February 9, 1813 (Madrid). DRY SERRANO, Carlos: Godoy. The man and the politician (Madrid, Espasa Calpe, 1978). SOLAR and VIVES, Rafael notes for the life of the excmo. SR, D. Gabriel Ciscar (Valencia, 1927).